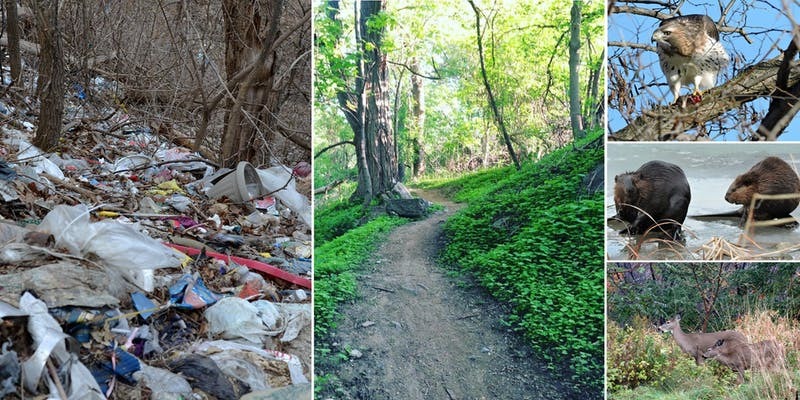 On April 27th 2019, we invite you to join us in the critical and ambitious project; together we will clean and restore a section of the Lower Don Ravine which has been subject to dumping and neglect. This event builds on the existing efforts of local community groups who have been working to help keep our ravines clean. Joining this effort are friends of the Don, families, children, cyclists, mountain bikers, canoers and kayakers, dog walkers, nature enthusiasts, neighbours, trail runners, concerned retailers including Salomon and Arc’teryx, members of environmental groups and stakeholders such as Evergreen and Toronto Field Naturalists. Torontonians all, uniting to revitalize a forgotten ravine in Toronto’s largest green space – The Don Valley. This event is an initiative by Don’t Mess with the Don and supported by Evergreen, Greenpeace Canada, Zero Waste Hub Toronto, Salomon, Arc’teryx and One Piece a Day. If you wish to sponsor our event, please send an email to: info@dontmesswiththedon.ca. Thank you! Where is the link for the May 11th event? No post yet we are focusing on 27th. Will put something up after.